Polio's Surge In Pakistan: Are Parents Part Of The Problem? : Goats and Soda Health workers are trying to convince parents to give children the polio vaccine, but the program faces violent opposition. Harvard researchers polled the parents. They were surprised by the results. Usman (right), 7 months, and Abdullah (left), 18 months, are held by their mothers while they wait to receive the polio vaccine at the Jalozai refugee camp near Peshawar, Pakistan. What do the parents think? That's always a crucial question when it comes to vaccinating kids. And it's particularly important in Pakistan, which is one of the last places in the world where the polio virus is still making kids sick. Health workers in Pakistan are trying to convince millions of parents to allow their children take the polio vaccine. But the program faces vehement — and at times violent — opposition. So researchers at the Harvard School of Public Health recently did a poll to find out if parents are part of the problem. The results surprised them. Frankly, if someone came to my house and said, 'You know, you don't know me from Adam, but I'd like to vaccinate your child,' I wouldn't let them. Imagine you're a parent in northwest Pakistan. You live in a remote village, perhaps in a mud hut on top of a mountain. Every few weeks some strangers carrying vials of a clear liquid come knocking on your door. "Frankly, if someone came to my house and said, 'You know, you don't know me from Adam, but I'd like to vaccinate your child,' I wouldn't let them," says Sona Bari, of the World Health Organization. But eradicating polio worldwide depends on these parents in Pakistan saying yes. Strangers showing up at your door isn't the only hurdle to getting children vaccinated. 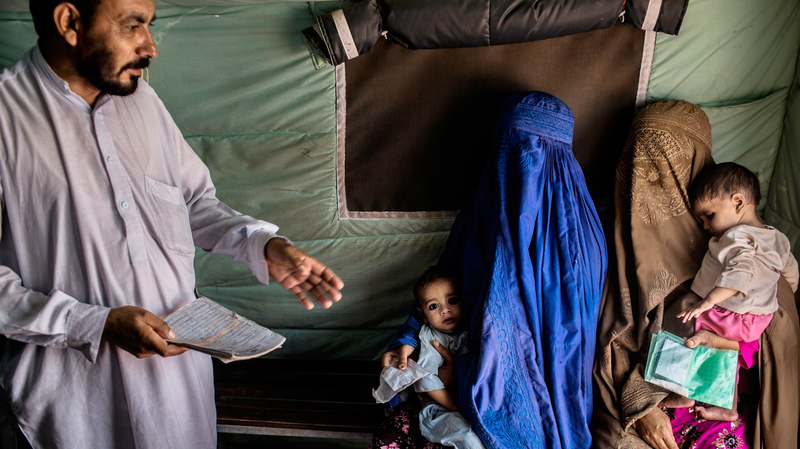 In Pakistan, the Taliban threaten to kill parents who immunize their kids. More than 60 vaccinators have already been killed in the past two years. "There have been health worker attacks, and there have been bans on polio campaigns for two years now," says Sherine Guirguis of UNICEF, a co-sponsor of the vaccine poll. "So there's this climate that we're working in." The result of those bans: a surge in polio cases in Taliban-controlled regions. About 50 kids have been paralyzed this year in the two regions where the polio vaccine is banned, North Waziristan and South Waziristan. The message to parents from all this: Don't even think of opening your door for a vaccinator. And it's not just in the regions controlled by the Taliban. Rumors about the vaccine are common across Pakistan, the Harvard poll found. "The vaccine is not halal, for example," Guirguis says. "Or that it's not made with ingredients that they feel comfortable with." There's also the belief that the vaccine is a Western plot to sterilize Muslim children, or worse, that the vaccine gives kids AIDS. On the plus side, only 1 in 10 parents nationwide thought the rumors might be true, the Harvard poll found. And even in the Federally Administered Tribal Areas, or FATA, only about a third of parents thought there might be something to the tales. But researchers say these rumors can still be a problem. "People don't necessarily have to believe them in full," says Harvard's Gillian SteelFisher, who ran the poll. "But you worry about that kind of atmosphere of misunderstanding about the vaccine." That's because of another challenge facing the polio eradication effort. With other vaccine initiatives, it's enough to reach a good majority of kids. But when it comes to polio, health workers are trying to wipe this disease off the planet. So even reaching 75 percent of kids isn't good enough, says UNICEF's Guirguis. "Polio is a 100 percent program," she says. "You need to find every child, living in the most far-flung area, living in the most conflict-affected area." And vaccinators don't need to reach kids only once, or even twice. They need to convince parents to vaccinate their child at least four times, in a single year. That's what it takes to get full immunity with this vaccine. And when vaccinators keep showing up, some parents start to get exasperated, the WHO's Bari says. "So this is one of the few services they're seeing come to their door, for free," she says. "And yet it's coming over and over, which is something that's hard for them to understand." Polio is a big priority for the international community. But it's become rare enough, even in Pakistan, that a lot of parents haven't ever seen it. It's not really on their minds. The Harvard poll found that many parents don't think polio is that serious — that the paralysis it causes is curable. It isn't. And yet, for all of these obstacles, when vaccinators can get to homes in the FATA region, parents there aren't turning them away. The poll found that among parents who confirmed that a vaccinator reached their door, 95 percent said that yes, their child did get the vaccine.